Be it, Valentino Rossi or Travis Pastrana, the greatest of riding champions always started young. 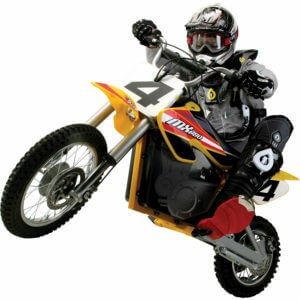 Now, even if your child is not eyeing that title, a dirt bike makes for a great present – there are no two ways about it. A toy like a dirt bike is a total win-win. Your kid gets a taste of the complete riding experience in a bike shrunk down to his/her size, while you sit back, not really bothered by the risks that come with riding a traditional motorbike. It’s small, got less power( well, comparatively) and is lightweight. These scaled-down, battery-powered dirt bikes are a fun way for younger riders to live out their off-road fantasies. Now, getting your hands on the right bike could be tough. You have to pick the one that is of the right size, has great safety features, sturdily built and well, reliable. That is why we are here, bringing to you the top ten dirt bikes in the market right now. To tell you what makes them a part of this list and to help you choose the right one for your kid is our goal. Is Your Kid Ready to Ride? Founded in 2000, the Razor brand embodies the spirit of fun and freedom. Today, Razor offers a full line of products that inspire and excite riders everywhere and guess what? the Razor MX350 is a big part of this family. The Razor Dirt Rocket MX350 is a miniaturized version of a motocross bike. It’s scaled down design can handle riders up to 150 Lbs. It comes with a chain-driven, variable speed motor which enables a super silent yet powerful operation. The MX350 is well assembled, having dimensions of 44×24.5×31 inches. Weighing a decent 70.25 pounds, this product is great for kids aged between 5-8 years. ​The bike claims to run for over 10 miles on a single charge and comes with a large 10’’ knobby patterned tires that help keep traction over uneven surfaces and offer maximum power transfer. The 350-watt electric motor runs on a 24V battery which takes about 12 hours to charge fully and can stand a good 30 minutes of continuous usage. A very handy feature is that handlebar height can be adjusted according to your kid’s needs. It can achieve speeds up to 14 mph which makes this a cracker of a product at its price. Large pneumatic knobby tires for greater traction. Speeds up to 14 mph. High torque, chain driven motor which is quite powerful. Comes with soft rubber grips and adjustable riser handlebars for a smooth and comfortable ride. This bike is a classic. 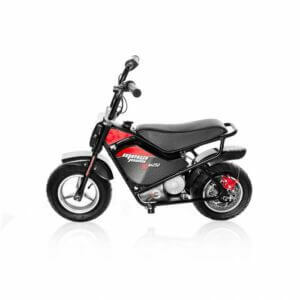 The Monster Moto 250watt is an e-Mini that is built to last with the same durable construction and welded-steel frame as their gas-powered products. It looks very classy and weighs a good 51lbs and has the dimensions of 36×22.5×29 inches. ​​The MonsterMoto is one of our favourites when it comes to safety. It has a metal disk brake which is a rare sight in e-bikes. It runs on a 24V lithium battery and goes up to a modest speed of 12 mph. That’s not all. It comes with a toggle switch that can be used to limit the bike’s speed down to 7mph. This is great thinking by the manufacturers as it makes learning easier. Furthermore, it comes with a battery level indicator mounted on the handlebar. The battery on this takes 5 hours to charge completely and keeps you going continuously for a good 45mins to 1 hour. The reviews on Amazon seem to confirm this fact. Let’s look at the highlights now. The reinforced welded tubular steel frame and polypropylene no-dent fenders make this bike one the most well-built product in this category. The speed limiter can be invaluable for kids who take a while to catch on. Comes with metal disks brakes. That is wonderful. All in all, the MonsterMoto is a rugged and stylish bike for a 6-10-year-old kid. It might not be the quickest and the lightest but that is because it doesn’t aim to be one. It limits its performance in order to provide better comfort and sturdiness. We totally recommend the MonsterMoto to anyone who is looking for a durable, safe and stylish ride with a decent performance. The MX650 is the second Razor bike on this list. Being deeply rooted in action sports like motocross and BMX has enabled Razor to produce a few really interesting products. The MX650 is like a more advanced version of the MX350. Sporting a 650-watt battery and offering a top speed of 17 mph, this bike can make your kid look a real badass. But you might have to shell out a few extra bucks though. It has a dimension of 46 x 12.7 x 26.3 inches and is a bit on the heavier side, weighing a 113 lbs. The Variable speed, high torque, chain driven motor and a body of steel makes this bike a performer. It might not be suitable for little kids but kids aged 10-13 years are going to love this. The bike further comes with a twist-grip acceleration control which means you can throttle it like a traditional bike. The bike can handle up to 40 minutes of continuous usage, which is great. The reviews on Amazon agrees with this and suggests that the bike handles pretty well and is really quiet. ❖ A powerful 650-watt battery and a top speed of 17 mph. ❖ Comes with a well-built body of steel that handles pretty well. Now, if a mid-range, friendly neighbourhood dirt bike is what you are looking for, then look no look further. It is electric, heavy and really well made; and you can rip it at 17 mph. 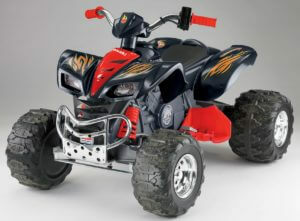 This makes the MX650 the perfect gift for a 10-13-year-old. They’ll absolutely love it! 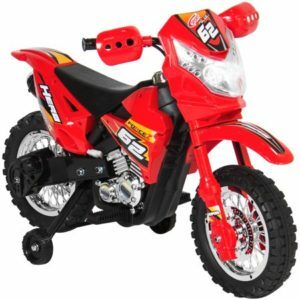 Best Choice Products 6V kids dirt bike is our recommendation for little kids aged 2-4 years. These bikes are built large and scaled small for your little one’s biggest adventures. It comes with training wheels and a top speed of 2 mph which is great for a little backyard or outdoor ride. Made of ABS Plastic, the bike looks pretty realistic with treaded tyres and exhaust. It has an overall dimension of 41×20 x28 inches and weighs 20 lbs. The bike looks very colourful, comes with built-in headlights and radio. The bike has a 20-watt motor running on a 6V rechargeable battery. Though the bike recommends riders of age 3 years and above, the customer feedback online suggests that the bike underperforms when ridden by a 4- to 5-year-old. Very affordable and looks very catchy. Comes with headlights and an easy set of controls. It’s got built-in tunes so that your kids never have to stay away from music. According to us, this bike performs better than any of its competitors in this age category. Its got everything needed to keep your little one entertained. The headlights, the radio and bright colours make it a really cute and enjoyable ride for our tiny champions. 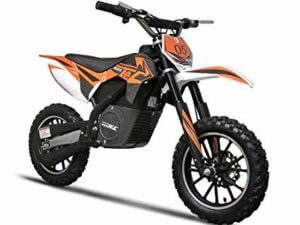 MotoTec 24V dirt bike is an all-rounder. On this bike, your kids can cruise over bumps, speed through dirt trails with ease. A great product for playground, driveway and backyard fun. The MotoTec runs on two 12V batteries and takes around 4-6 hrs to charge fully. What makes this bike stand out is that offers a 3-speed selection option that enables the bike to run at 5, 10 or 16 mph. Furthermore, a great suspension ( 2 Front shocks, 1 Rear shock ) makes the MotoTec a blessing for your kid’s bottoms. The MotoTec weighs around 66 lbs and has dimensions of 44x22x32 inches. Another strength of this bike is its safety. It comes with knobby pneumatic tyres and also offers front and rear disc brakes. 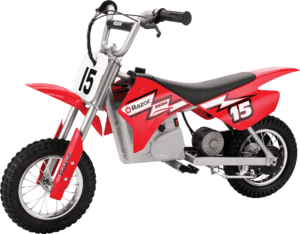 This bike can run for a good 45 minutes on continuous usage, making it a great ride for kids of age 8- 12 years. This bike is one of the few bikes that are well worth the money you spend on it. Sports a fairly powerful motor offering speeds up to 16mph. Looks gorgeous, comes with front-rear suspensions and front-rear disc brakes. Selectable speed available, giving you the power to set a safe speed limit for your kids. We’re pretty sure you are now confused between the Razor MX650 and the MotoTec. Both are great bikes but that doesn’t change the fact that they have a few differences. The MotoTec doesn’t go as fast as the MX650. It’s not as powerful and is pretty light when compared to its rival. The MX650 on the other side doesn’t come with dual suspension and a selectable speed limit. So, if you are looking for a more controlled and lighter beginner bike, the MotoTec is the obvious choice. It all ultimately comes down to personal preferences. This is another mid-ranger from Razor. 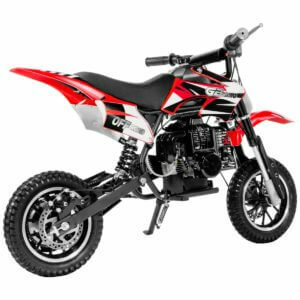 The MX400 dirt rocker is suitable for riders aged 8- 11 years (though Razor recommends 13 years and up) and can achieve speeds up to 14 mph. Like the previous Razor bikes on the list, the MX400 comes large 12-inch knobby Tyres for maximum power transfer. This scaled down bike can carry riders up to 140 lbs. The bike has the dimensions of 24.5×45.5×10.5 inches and weighs a modest 62.5 lbs. One feature that sets the MX400 apart from its siblings is the adjustable handlebars. This helps keep the throttle and brakes at a comfortable reach for your kids who are rapidly growing. The powerful, single-speed, chain driven motor offers a smooth and quiet riding experience. The adjustable handle option can come in very handy. Offers good power and speed for the price. ​The MX400 is very similar to its younger sibling, the MX350. They offer the same features, the only differences being the adjustable handlebar and a tiny bit of extra power in the MX400. The MX400 further comes in a variety of colors making it another great choice for this category. Now we enter the traditional gas-powered section. Although these bikes generate a lot of noise when compared to their electric counterpart, they have a lot to offer. 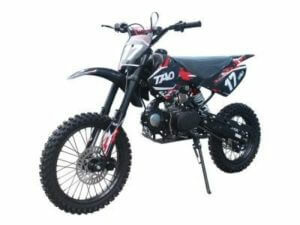 The Taotao DB17 125 cc is no different. The specs it offers matches right up to its price. The features it extends are very similar to that of a full-fledged dirt bike. This is one of those bikes that’s meant for a kid who is serious about his riding. The power, top speed and ride quality it offers make it a great choice for teenagers and adults. The double disc brakes and a strong chassis adds to the safety. The XtremepowerUS built this bike to provide users with stability and speed without sacrificing their safety and control. This bike comes with a 49CC, 2-Stroke engine meant to soar through any road with ease. It might appear to be small, but it’s got a lot of power to offer. Weighing 45 lbs, it has dimensions of 43x26x28 inches. Again, the large knobby tires, strong front and rear disc brakes, and superior suspension gives the rider good control over the vehicle. You can go up to 20 miles per full tank, touching speeds of 20 mph. This well-built bike comes with foldable footpegs and retractable kickstand. Both the brakes on this bike are hand operated. Recommended for kids 13 years and above, the bike might turn out to be small for an average kid of that age group. If your kid is 10- 11 years old, then the Xtremepower makes for a really cool choice. The steel frame provides extra stability and durability. The front hydraulic and rear spring suspension acts as a decent anti-vibrating system. ​This bike looks great and we’re pretty sure that it would make you feel great. It is packed with a 2 stroke engine which unlike a 4 stroke provides greater acceleration. But at the same time, it is a 49CC engine. This ensures that the speed is in check, making it suitable for beginner riders. 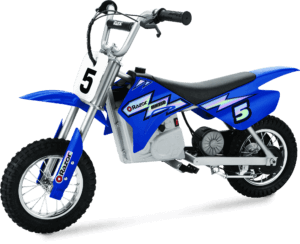 The Coolster Kids gas mini is a great beginner bike for kids aged 7-10 years. It has a gas-powered, 70CC engine that produces good power. It’s semi-automatic and has 4 gears. The Coolster mini can bear a load up to 130 lbs and sports a 1-gallon capacity fuel tank. The bike has dimensions of 52.8×24.8×32.5 inches, weighing 110 lbs. 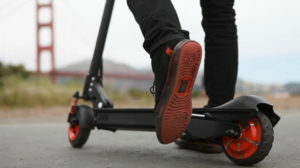 It can go up to 30 mph depending on the road condition and riders weight. The decent suspension ( fork at the front, mono shock at the rear) and a modest braking system offer a nice experience to the rider. It comes with the traditional kickstart. The dirt bike comes with 90% of its parts assembled. Only the handlebar and tires have to be fixed to get started. The bike does start on the very first kick and warms up pretty quickly. Braking and gear shift are really smooth. All in all this bike is a good option if you’re looking at some trail riding and mud playing. The safety features, a comfortable seat and decent power makes this bike a really reliable ride. Getting started is easy as 90% of the bike comes assembled. Getting a gas bike for a 7-10-year-old can be a tough choice to make. We as parents are bothered about the safety of our kids. But Coolster Kids gets everything right with the Gas Mini. A powerful engine (70cc) with a gentler acceleration (4-stroke), loaded with safety features (foot brake and suspension) makes this one of our favourite choices. But again, we would recommend parents to pay very close attention if your kid has no prior experience riding bikes. The Mega Moto Mini is a bike that brings great features at a fairly low price tag. The bike comes with an 80CC, 2.5HP engine that can hit a maximum speed of 23 mph. It comes with an automatic clutch that ensures easy operation. The bike weighs 89.5 lbs and has dimensions of 15×50.3×25.5 inches. Small but yet powerful. The large comfortable seat, spring-loaded footpegs, treaded tyres and a motorcycle style throttle provide the rider with a smooth and controlled ride, even on rugged terrains. The chassis is constructed with a tubular steel frame that extends its durability. Safety features like a chain guard, exhaust heat shield, engine stop switch and a hand operated rear disc brake make this bike one of the favourite options when it comes to safety. Little kids with little hands might find catching these brakes quite challenging though. 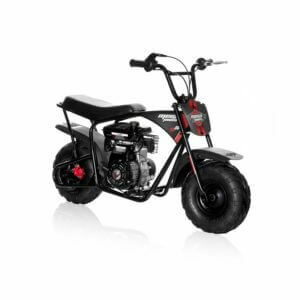 Nevertheless, the MegaMoto Mini is a great choice for kids aged 8- 10 years. Built keeping durability, stability and safety in mind. The classic look and a fairly powerful engine make this bike a fun ride. Fairly cheap considering the features it offers. The difference between the CoolsterKids and the MegaMoto is the target customers. For a kid with no prior experience, the CoolsterKids might end up a little hard to handle. But with the 2.5HP engine ( compared to 5.44Hp on Coolster ) and a top speed of 23mph on the MegaMoto, makes it a safer choice. Another difference being the handheld brake on this bike and the foot brake on the CoolsterKids. So again down to personal preference. We totally recommend the MegaMoto gas bike for a younger inexperienced kid. We’ve covered all age categories in our top ten recommended bikes. We’ve also covered the different types, that is, electric and gas-powered. All of them are wonderful bikes. Choosing one out of them for you would be pointless as that would mean that we are assuming your requirements. In the conclusion section for each bike, we’ve mentioned what makes that particular bike different from the rest and what target customers would find it satisfactory. An easy way to come up with a final choice would be to list down your priorities first. This would make it easy for you to understand the reviews and eliminate the ones not suitable. Choosing the right bike for your kid from a large pool of available bikes could be a daunting task. Every child is different in some way or the other. We picked up our top ten keeping in mind to cover all types of kids who fall in different age categories. We considered the bike’s dimensions, comfort and durability to come up with the ones that would meet the physical attributes of a kid in each category. Then we compared the performance, safety features and other technicalities to find the most reliable amongst them. Finally, we put together what the bikes offer and for how much. The top 10 bikes that managed to pass all the above criteria were picked. Times have changed. More and more kids opt video games over out-door games these days. The only thing we as parents could do is make outdoor activities interesting for them. Kids love riding, they see every ride as an adventure. Furthermore, riding is something that can engage their minds and bodies, making them physically active. Dirt bike riding could also help develop important skills like control, coordination and focus in them. It’ll keep them physically and mentally alert. This is really important growing up. It is a productive way to pass time, to say the least. Most importantly, the thought of riding a dirt bike will put a big smile on your kid’s face. That’s worth everything. Like we said earlier, every child is different. So is every bike. Any kid over 3-4 years of age should able to ride. It’s just about finding the right bike for them. This is where review like ours come in handy. It helps you analyze the different options available and come up with the most suitable one for your child. Initially take it slow. Keep it to short backyard rides until the kid gets used to the bike. And remember, your child’s safety should be your number one priority. Good helmet, elbow and knee pads, a good back and/or chest protector are some add-ons we strongly recommend. 1. What do I go for? Electric or gas? ​This comes down to personal choice. 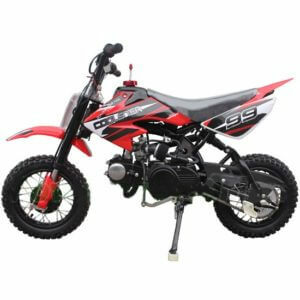 Gas powered mini bikes have been in the market for a long time now but it is the electric ones that are growing popular. Simply because they come cheaper, offer easy maintenance and are generally quiet, eco-friendly machines. The gas-powered bikes are way more powerful than their electric counterparts and well, way more expensive too. Close attention needs to be paid if your kid is a beginner on a gas bike. 2. How much battery time is considered good? ​Providing a longer battery time has always been a challenge for electric vehicle manufacturers. In this case, a 45 minute to 1-hour continuous usage capability can be considered pretty good. 3. How to choose the right size for my kid? ​For an electric bike, the right size depends on the load capacity and dimensions. 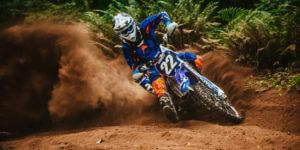 As far as the picking a right-sized gas-powered dirt bike is concerned, a general rule is that a 6- to an 11-year-old child should ride a dirt bike sporting an engine size of 70CC and lower, while 12- to 15-year old kids can ride bikes up to 90CCs. Keep in my mind not to buy a bike larger in size hoping for your kid to grow taller, it doesn’t work like that.